Jake Jones led the Four Cylinder field to the drop of the green flag in the 40-lap feature. Harry O’Neill kept his car glued to the outside and led the first circuit by a bumper over Jones, John Ayre, Scott Adams and TJ Kapish. A yellow slowed the show for the first time on lap nine and then another flew following the restart when Kapish and Shawn Kistler tangled in turn four. Neither driver was able to continue. With the green back in the air, Joe Barbush III began to advance. He moved into third on lap 14 and then overtook J. Ayre for second two laps later. There were several opportunities for J. Barbush to have a shot at the leader, but O’Neill pulled on each and every restart. O’Neill went on to take the victory, followed by J. Barbush, Adams, Tony Rispin and J. Ayre. Jones, O’Neill and J. Ayre were heat race winners. Kyle Krempasky was the consi winner. The always exciting and entertaining Four Cylinder division took to the stage with Jay Skupski on the pole. 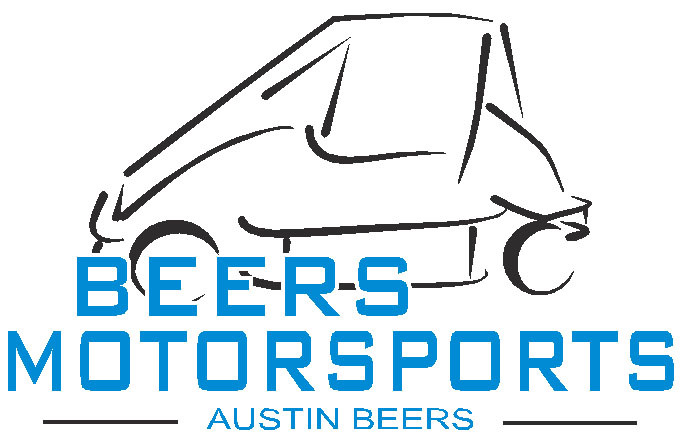 However, young Austin Beers started second and quickly took the lead. The led the opening lap over Skupski, Shane Troutman, Jake Jones and Shawn Kistler. The action was intense throughout the field and with eight laps complete, Mark Spencer held the lead. 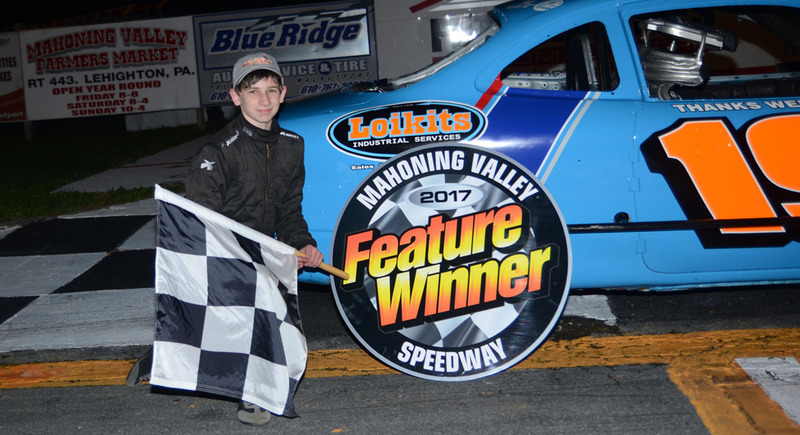 He encountered mechanical issues, which gave the lead to TJ Kapish and then Devin Schmidt, who was heavily pressured by Corey Edelman in the closing laps. Schmidt held on for the lucrative victory over Edelman, Kapish, Troutman and Jeff Biegly. Edelman was later disqualified for being light across the scales in post race tech inspection. Schmidt, Beers and Jones were heat race winners. M. Spencer was the consi winner. Shane Troutman led the Four Cylinder field to the drop of the green flag in the 20-lap feature. He led the first circuit over TJ Kapish, Shawn Kistler, Corey Edelman and Austin Beers, With a lap in the books, Kapish moved to the front. He continued to hold the spot at halfway and Edelman made his way into second. Harry O’Neill joined the mix of action and made a three wide move stick on lap 16 to snag the lead. He remained out front over the closing laps to take the win in the caution free event over Edelman, Kapish, Kistler and Bob Azarowicz. Brayden Spencer, Kapish and O’Neill were heat race winner. After winning his heat race earlier in the evening, Shane Troutman started from the pole position and led the Four Cylinder field to the drop of the green flag. 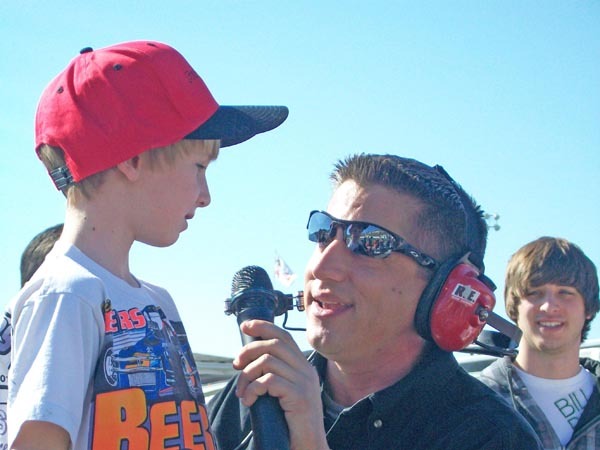 He led the opening circuit over Shawn Kistler, Brayden Spencer, Bob Azarowicz and Austin Beers. With Troutman still showing the way on lap four, Devin Schmidt worked his way into fourth before the yellow flag waved on lap six when several cars tangled between turns one and two. Following the incident, Kistler was the race leader for the restart, with Spencer to his outside. Green flag racing resumed and Spencer got a great run off of turn two. The high side pass moved him into the lead. Shortly after, Schmidt got by Kistler for second. The remainder of the show went caution-free and Schmidt reeled in Spencer. The two fought hard all the way down to the stripe, where Spencer earned his third win of the season by a half car length. Schmidt finished in second, followed by Azarowicz, Harry O’Neill and Kistler. 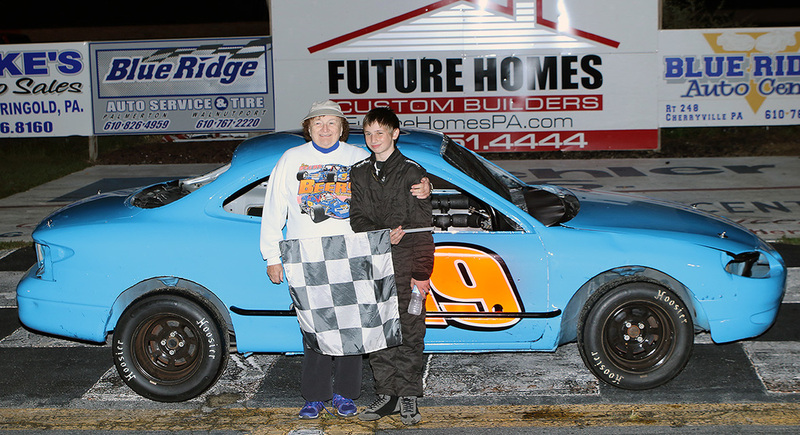 Harry O’Neill started from the pole position in the 20-lap Strictly Stock feature and led the opening lap over TJ Kapish and Bob Wink. With two laps complete, Kapish made the pass, which ended up to be the race winning move, as he drove off to take the checkers over O’Neill and Wink. More than half of the cars didn’t start the feature due to problems following the heat races, which were won by Kapish and Wink. 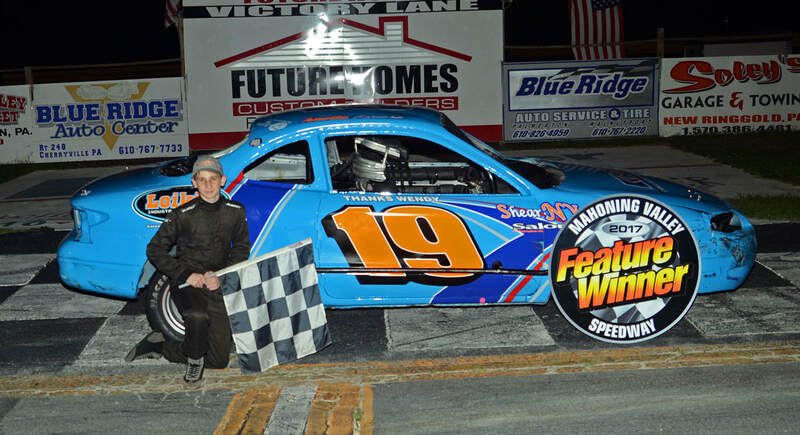 From the pole, Josh Oswald led the Four Cylinder field to the drop of the green flag in the 20-lap contest. 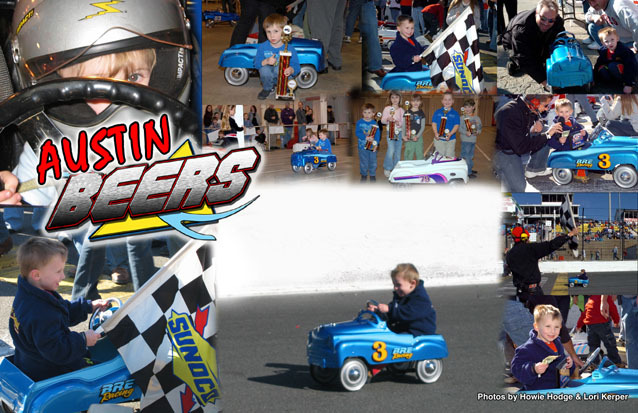 Shawn Kistler took the top spot to lead lap one, followed by Oswald, Devin Schmidt, Austin Beers and Corey Edelman. The entire event was action packed, especially near the front. With Kistler still showing the way on lap five, Schmidt overtook Beers for third. He moved by Oswald a lap later to take second and then TJ Kapish slipped his way into third. Just past halfway, Kapish attempted several three wide moves to overtake the leads. He cleared Schmidt on lap 10 and then got by Kistler and moved into the lead on lap 11. Without a yellow flag to slow the show, Kapish managed to hold off his competition in the action packed six minute feature. He took the checkers for his first victory in the division over Schmidt. Jimmy Ayre made a late race charge to finish third, followed by Edelman and Harry O’Neill. Beers, Edelman and Brayden Spencer were heat race winners. Led to the line by Jay Kanor, twenty Four Cylinders took the green flag. Josh Oswald led the first lap, followed by Austin Beers, Jay Skupski, Shawn Kistler and Bob Azarowicz. Beers worked by Oswald for the lead on lap two and Devin Schmidt cracked the top five on the following circuit. Schmidt continued to go forward and overtook Oswald for fourth three laps later. Meanwhile, Brayden Spencer climbed to second and drove up to challenge Beers for the top spot. Shortly after, a pair of yellows waved. First, for a Skupski spin in turn three and then another for a tangle in the same turn involving Taylor Schmidt, Cody Geist and Kevin Behler. Green flag racing resumed and Spencer made his move on Beers for the lead stick. The action slowed for the final time just past halfway when the engine on Jake Jones’ mount expired in a big way. A quick fire erupted and then quickly extinguished itself. Jones exited his ride unscathed. Spencer retained the lead following the restart. Shortly after, D. Schmidt shot by Beers for second and Harry O’Neill followed through to take third. D. Schmidt worked his to the back bumper of Spencer and then gave him a shot in the final corned on the last lap. In exciting fashion, Spencer retained the lead and both O’Neill and Ron Heeter slipped by D. Schmidt for second and third respectively. D. Schmidt crossed the line in fourth, followed by Beers. Heeter was later disqualified in post race tech inspection, which moved Schmidt and Beers up one position and Jimmy Ayre advanced to fifth. Beers, TJ Kapish and O’Neill were heat race winners. Scott Adams started on the pole position in the 20-lap Four Cylinder feature. He led the opening lap over Austin Beers, Cody Geist, Ron Heeter and Kyle Krempasky. Following a pair of lap eight yellow flags, Heeter, who had been riding in second, made a move on Adams stick and he took the lead. Meanwhile, Spencer moved into third and got past Adams for second on lap 13. Heeter held the lead to the finish and was able to pull of the victory over Spencer, Adams, Krempasky and Cody Geist. 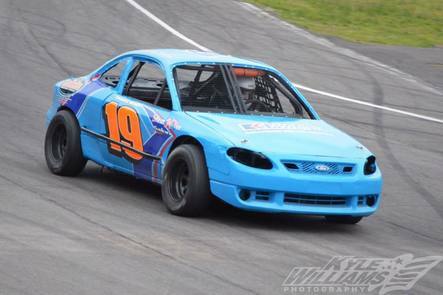 Austin Beers led the Four Cylinder field to the drop of the green in the 20-lap feature. 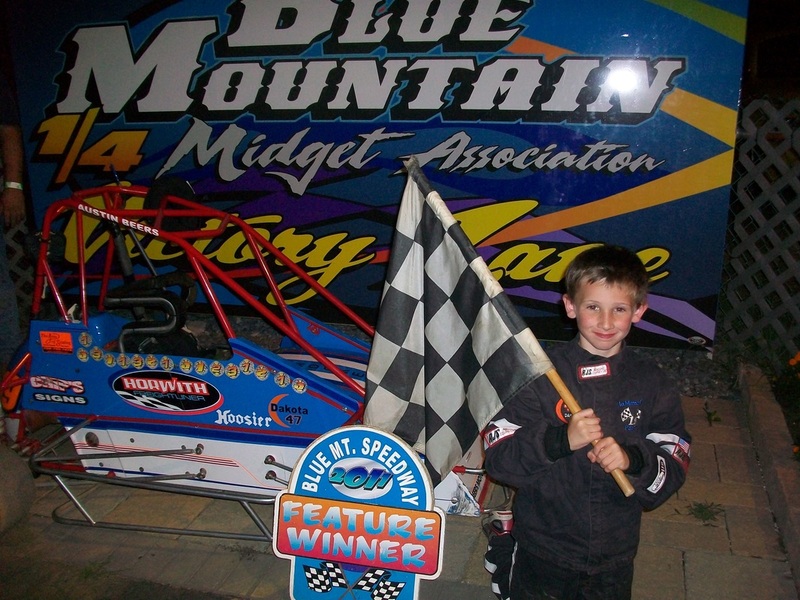 He led the opening lap over Brayden Spencer, Ron Heeter, Jay Skupski and Shawn Kistler. With one lap in the books, Spencer worked around the outside of Beers and into the race lead. One lap later Skupski moved to second. 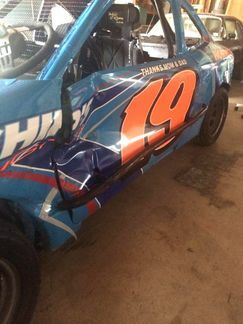 The worst of three cautions occurred when Heeter tangled with Kistler while coming off of turn two. Both cars received damage, yet following quick crew work, both were able to continue. Twenty Evan’s Roadhouse Four Cylinders lined the pit area and 19 took the green flag. 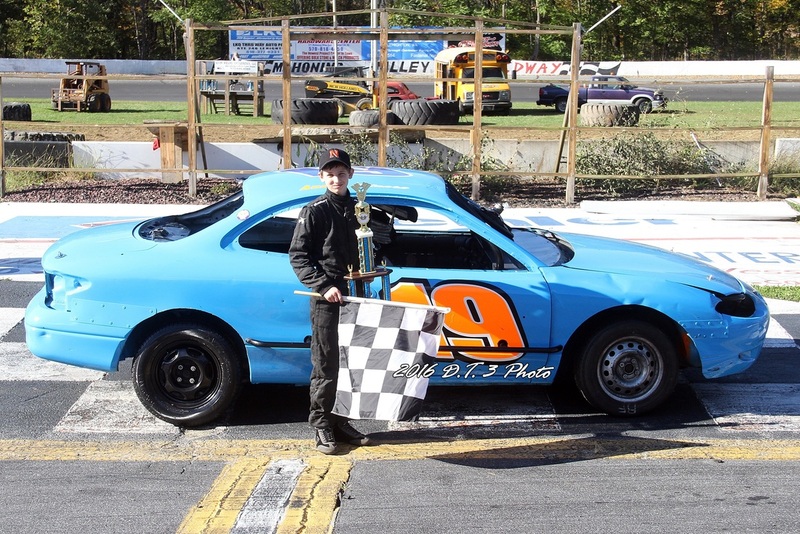 Pete Verwys sat on the pole for the $450 to win, 40-lap feature, but he was overtaken by 13 year old Brayden Spencer before a lap was complete. Harry O’Neill sat back in third with Ron Heeter and Bob Azarowicz in tow. With four laps complete O’Neill moved by Verwys for second and he set his sights on Spencer. Meanwhile, TJ Kapish cracked the top five. O’Neill and Spencer battled side by side for the lead, which O’Neill took on lap 11. Spencer fought back to regain the spot to lead lap 19 and then O’Neill took it back again a circuit later. Verwys and Kapish tangled on the front stretch with eight laps remaining. Unlike Kapish, Verwys was able to pit and continue. 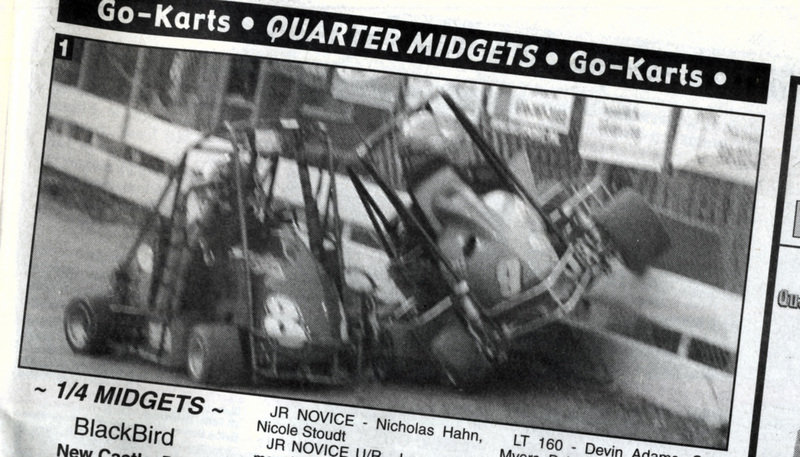 Spencer applied heavy pressure to O’Neill following the restart and the duo fought tooth and nail to the checkers. O’Neill crossed the stripe first, followed by Spencer, Devin Schmidt, Heeter and Azarowicz. Verwys, Spencer and O’Neill were heat race winners.